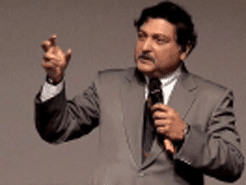 The high point of this year's Scottish Learning Festival, for me and many others, was the keynote by Sugata Mitra, professor of educational technology at Newcastle University, and the man whose experiments all over India have convinced him that "education is a self-organising system where learning is the emergent phenomenon." In other words if we give children a computer and the right conditions they can teach themselves anything. A "friendly but not knowledgeable mediator" is useful. But a teacher is not required. I had interviewed the professor by telephone for TES Scotland the previous week, but he had kept some good stuff back for his keynote. I'm going to try to capture the content and flavour of that talk here, as well as some of the humour that makes his talks so enjoyable - the humour of a man, gently amused himself and generously sharing it with his companions. "Having experimented for years in these very remote places," he told the packed Clyde Auditorium, "I came to the remotest place I know - Gateshead." He chuckles, and so do we. "That's how I start my Indian lectures," he says, in a storytelling aside: 'Five thousand miles from New Delhi, across the River Tyne, there lies the hamlet of Gateshead." But while humour is the medium at times, the message could not be more serious, and Mitra's commitment to the research he launched 11 years ago with the first hole in the wall computer - and took all over the subcontinent and beyond - is readily apparent. "It sounds like a lifetime's work," I had commented, after listening to his description of what he had done and what he still wanted to do - an extensive longitudinal study that would determine if his methods "had really levelled the playing field". His hesitant response had surprised me. "Yeah, well, it looks like. One gets into these things, you know. People sometimes ask if I have this passion for teaching children. I have no such passion. I have a curiosity about how the brain works. I like to know why people think the way they do - why they remember, why they forget. We need to understand what is happening inside the neural circuits - once we know that we will really understand education." But if the initial passion was a scientist's search for knowledge and understanding, the motivation now is broader and deeper. "I wanted to know the physics of thinking," he had told me. "But that landed me into children's education and this work - which is so important socially that my conscience will not now allow me to get away from it." The scale of the social problem all over the developing world is illustrated by India, he says, where schools and teachers are in such short supply that conventional efforts to educate are bound to fail. Over 120 million Indian children do not go to school, he says, because they have none to go to. Making up that deficit would require tripling the number of schools and teachers. "There is not enough money to do this, nor enough time. The problem is just too large to solve with traditional linear methods of scaling up." So is there another way? Mitra's experiments have convinced him that there is, he tells his audience, and that it lies in the idea of a self-organising system, a concept well-known to physics. There are also similarities, he points out, with the "spontaneous order" of the economist Friedrich Hayek. "That is what we are seeing in my experiments, and several educationists have approached the idea. The difference is that when they were talking about these ideas the internet did not exist. I have an unfair advantage. I can stand on their shoulders and go further." The stock-market is a self-organising system. So is the weather, he explains to his audience. 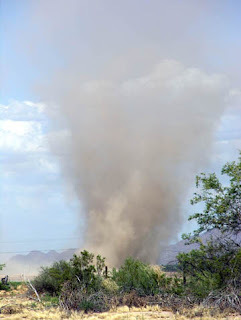 "A dust-devil is a self-organising system. There is a bit of a breeze and suddenly the structure forms and starts to move around. A self-organising system is one in which the system structure appears without explicit intervention from outside the system." The capacity for surprise is what distinguishes such systems. "They show emergence," says Mitra. 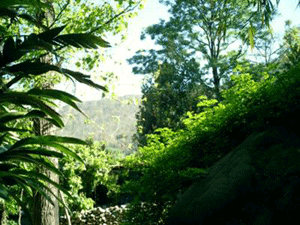 "This is the appearance of something not previously observed. We react with surprise when a little Tamil-speaking girl says 'replication of the DNA molecule'. It's emergent. It happens from within the system." This is the reason, he suggests, that children were able to teach themselves how to use the hole-in-the-wall computers he left without instructions, in cities and villages from the Himalaya to the southern coastline. His response to the curious kids who would gather as he was building these - and building in robustness to the weather - becomes a little refrain in his keynote. "What should we do with this," the children would ask Mitra in their own language, for most spoke no English. "I don't know," he would reply. "And anyway I'm going." A few months later he would come back to find the children using the computer and the English words needed to do so, having taught themselves and each other in the meantime. He describes one seminal experiment in Hyderabad - "a sprawling, south Indian city with many private schools for the poor. "They exist because they promise to teach English. So parents pay a few pounds a month to have their children educated, because being able to speak English makes a huge difference to their future. 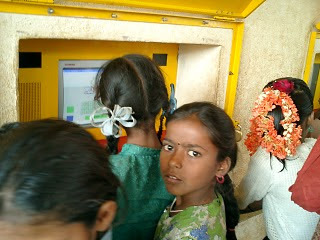 "The schools do their best, but native English speakers do not go into the slums of Hyderabad to teach. They have to use local teachers who speak a language called Telegu. They have a very strong accent which is almost unintelligible." Again the amused aside, shared with the audience: "If you thought Geordie was difficult then go to southern India." Given this language barrier, what Mitra did next - setting up a computer in Hyderabad equipped with a speech to text program - should have been pointless. "You talk into the computer and it types the words, " he explains. "I trained it in a neutral British accent. So when the children spoke into it the computer typed complete nonsense, which made them laugh. I told them I would leave it for two months and they should try to make themselves understood. "The children said, 'How do we do that?' and I said - and this is the crux of the method - 'I don't know. And anyway I'm going. " Two months later a couple of very interesting things had happened. The children had improved their English, which was now clearer and more intelligible, both to an English-speaker and to the computer. But they had also done something more fundamental and richer in educational implications. "They had invented their own pedagogy," Mitra tells the audience and pauses to let that sink in. "I learned that not only can children achieve an educational objective but they can invent the pedagogy itself." He contrasts this with the conventional classroom in which "we take it on ourselves to make the pedagogy" and the children are "the recipients of it." The realisation that youngsters in his experiments were doing far more than learning facts and some skills came slowly, Mitra says. In the streets of Delhi, where he had set up his first hole-in-the-wall computer, the kids had now begun to Google their homework. "Their teachers were telling me that their English had become fluent and they had become deep learners." He was doubtful at first. Were they doing more than just copying off Wikipedia? Was there any real understanding being developed? 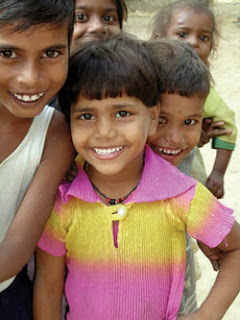 By the end of the second phase of experiments, around India and beyond, Mitra had demonstrated that groups of children could teach themselves to use a computer, navigate the internet and improve their English. He had begun to suspect they could do much more. So when the opportunity arose to pursue his research in England he bought himself an overcoat in November 2006, he says, "and came to Newcastle after 45 years in Delhi." The scepticism he met at Newcastle University challenged him to devise more ambitious tests, which in turn led to deeper understanding of the implications of his research for education in the developing and developed world. The hypothesis he now decided to test experimentally was that "Tamil-speaking 12-year-olds in a Tsunami-hit village in southern India could not teach themselves the biotechnology of DNA replication on their own". The experiment disproved this hypothesis. The kids could teach themselves biotechnology - but only at first to a level of 30% in tests. On their own, in a foreign language, from a starting point of 0%, this was already educationally startling, says Mitra. But it was still a fail. He began to ponder how to help the children to pass. The answer he hit upon - a "friendly but not knowledgeable mediator" - became a vital piece of the jigsaw that Mitra was beginning to call minimally invasive education. "A local organisation had an accountant, a young girl, who was great friends with the children and played football with them," he tells us. "I asked if she would help them pass the test. She wondered how, when she didn't even study science at school. I said: 'Use the method of the grandmother. Stand behind the children and admire them. Say: 'How did you do that?' 'Can you do a bit more of this?' 'I couldn't understand a word of that, if I was your age.'" The young "grandmother" did a fantastic job, Mitra says. "Two months later the children's test scores were up to 50% - the same as they'd have got in formal schooling. "It is all in this month's British Journal of Educational Technology." Mitra now began testing his ideas in schools in England and Australia, where the biggest problem he encountered, understandably, was getting the teacher out of the room. Digging deeper into the question of real education or regurgitation led to a surprising discovery, he says. Mitra set half a dozen GCSE science questions to a primary class working in groups at computers. The fastest group got all of them right in 20 minutes, the slowest in 45. When tested as individuals on the questions the class scored an average of 76%, he says "This is incredible for 10-year-olds on GCSE questions. "But the teacher said, 'So what? They just Googled the answers or looked up Wikipedia.'" So two months later Mitra came back and tested that same class again, individually and without access to a computer. "I knew I had hit the jackpot when I took back the answer sheets and corrected them," he says. "Because the average score was ... 76%. "There was photographic recall of what they had done, because they had done it themselves." The same experiment has been repeated many times since, he tells us, with similar results. Indeed one experiment in a Gateshead school recently threw up an even more startling outcome, which he is "still struggling to explain", he says. "The post-test results after six months were higher than the originals." The teacher's explanation is that the children kept thinking about the questions, coming back to them, investigating, finding out more for themselves. Mitra has summarised his findings about Self Organising Learning Systems, in a document that also provides practical advice to schools interested in trying them out: "These techniques and facilities can be constructed in any school and will result in significant improvement in children’s learning and examination performance," he says. "You cannot force a self-organising system to do anything - any more than you can force an apple tree to make apples." But what we can do, he says, is understand the nature of a self-organising system and create the right conditions for emergence. Mitra's experiments oblige us, as teachers, to re-examine our expectations of pupils. "The bars that we set for our children may be way lower than the bars they set for themselves," he says. They also shed a 21st century light on the age-old question of the curriculum. What should schools be teaching children? "I think this is very closely related to your Curriculum for Excellence," he tells his predominantly Scottish audience. "We are looking at two skills - reading comprehension and information search and analysis. We have to measure carefully improvements in both of these." Sugata Mitra concludes his Scottish Learning Festival keynote with a statement of the hypothesis that has emerged from a decade of research in schools across the world - ever since that first hole-in-the-wall in the slums of New Delhi. "Education is a self-organising system where learning is the emergent phenomenon." Right now this is speculation, he points out. But if it's true it will lead us to a physics of education and a hitherto unheard-of ability to predict educational outcomes. "I believe a physics of education lies just around the corner," he says. "And that therein lies the future of education." Sugata Mitra's keynote presentation at the Scottish Learning Festival 2010.